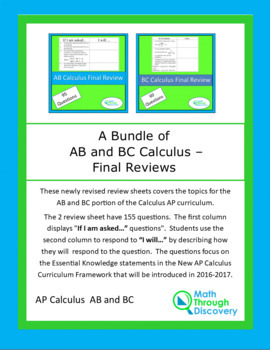 These newly revised review sheets cover the topics for the AB and BC portion of the Calculus AP curriculum. The 2 review sheet have more than 155 questions. The first column displays "If I am asked…” questions". Students use the second column to respond to “I will…” by describing how they will respond to the question. The questions focus on the Essential Knowledge statements in the New AP Calculus Curriculum Framework that will be introduced in 2016-2017. See the individual product descriptions for more information about each of the two review sheets.